St. James Hospital celebrated the opening of its new medical office building today at a ribbon-cutting ceremony and tour with community members, St. James providers and employees, UR Medicine leadership and elected officials, including New York Lt. Gov. Kathy Hochul. Located at 7309 Seneca Road North, in the former Wegmans plaza, the facility will officially open Dec. 10. “Our St. James Board of Directors is thankful for the dedicated work of so many partners that has brought us to this day of celebrating new facilities to support existing and new medical services for our community.” said Susan Gray, PhD, St. James Board Chair. Under the leadership of Gov. Andrew Cuomo, New York State has provided St. James $62.8 million in funding for the hospital and medical office building projects, as well as a new electronic health record system. Oak Orchard Health, a UR Medicine collaborative partner, also will be housed in the medical office building. Oak Orchard is a Federally Qualified Health Center that provides primary care, pediatrics and dental services. “The completion of this project marks the first step toward consolidating health care services in Hornell, beginning a new chapter for St. James on our brand new campus,” said hospital President and Chief Executive Officer Bryan O’Donovan. Construction of a new St. James Hospital has begun adjacent to the medical office building site and will be completed in early 2020. St. James became an affiliate of the University of Rochester Medical Center in March 2018. The partnership has brought new health care services to Hornell and the Southern Tier, includ­ing primary care, gastroenterology, imaging and otolaryngology, helping to increase access to care for patients. St. James collaborates closely with UR Medicine affiliates Noyes Memorial in Dansville and Jones Memorial Hospital in Wellsville, sharing clinical and operational resources and allowing each hospital to be stronger as part of a larger health care system. Volunteers at St. James Hospital contributed 170.5 hours to various departments throughout the hospital during the month of September. Those departments include Environmental Services, Information Desk, Gift Shop, Emergency Room, Progressive Care and Medical Records. St. James is actively searching for additional volunteers. Interested individuals are invited to call Connie Mullen at (607) 324-8748 to learn more about volunteer opportunities and get started on their volunteer journey. St. James Hospital is pleased to welcome Melissa Rackmil, RN, BSN, MBA, to the role of Chief Nursing Officer and Vice President of Patient Care at St. James Hospital, effective October 1, 2018. Ms. Rackmil joins St. James from Niagara Falls Memorial Medical Center, where she was Director of Invasive and Non-Invasive Cardiology and Director of Cardiopulmonary Services. In her new role, Ms. Rackmil will serve as the nursing executive who oversees the implementation of patient care within St. James Hospital, with a focus on improving quality, safety, and service in patient clinical outcomes. Her responsibilities will include developing methods to provide excellent care, managing clinical and patient standards, developing clinical policies and procedures, providing leadership to nursing staff, and working with leadership to transition clinical services to the new hospital, slated to open in 2020. According to St. James President & CEO, Bryan O’Donovan, "We are pleased to bring someone of Melissa’s caliber to our organization. She has extensive experience in directing outpatient and inpatient services, which will serve us well as we expand our health care model in collaboration with URMC and our regional colleagues." Ms. Rackmil received her Masters of Business Administration from SUNY Buffalo, Bachelor of Nursing from D’Youville College (Buffalo), and Registered Nursing degree from Trocaire College (Buffalo). She also has a Bachelor of Science in Speech Language Pathology from Buffalo State College. Founded in 1890, St. James Hospital is an affiliate of the University of Rochester Medical Center (URMC), one of the nation’s leading academic medical centers. St. James provides a range of inpatient and outpatient services, 24-hour emergency department, general surgery, orthopedics and rehab services, imaging and lab services, walk-in clinic, and a host of outpatient clinics through its URMC affiliation including cardiology, ENT, neurosurgery, neuromedicine, gastroenterology, and more. Volunteers at St. James Hospital contributed 212 hours to various departments throughout the hospital during the month of August. Those departments include Environmental Services, Information Desk, Gift Shop, Emergency Room, Progressive Care and Medical Records. UR Medicine’s St. James Hospital is welcoming two full-time general surgeons to its medical staff this month, strengthening the general surgery presence in Hornell with a range of leading-edge techniques and enhanced surgical capabilities, including advanced minimally invasive surgery. Brian P. Watkins, M.D., M.S., F.A.C.S., and Adam Basler, M.D., will be continuing the legacy that longtime Hornell surgeon A. Byron Collins, M.D., has built in the community over the past five decades. "The addition of these two surgeons to our medical team is the next step in growing the overall services available at St. James Hospital," said President and CEO Bryan J. O’Donovan, "as we continue our comprehensive plans to open a new medical office building this year and a new hospital in 2019." Watkins began July 15. He will be based in Hornell and will operate at St. James beginning in August, providing advanced minimally invasive surgery, endocrine surgery and broad-based general surgery. He also will serve as division chief for UR Medicine Regional Surgery, working collaboratively with established surgeons at affiliates Jones Memorial in Wellsville and Noyes Health in Dansville as the team focuses on strategies to grow the programs at their respective hospitals. He is passionate about rural health care and is excited to begin working with the St. James staff and becoming a part of the Hornell community. He recognizes the value of providing general surgery in the region, allowing patients and families the opportunity to stay close to home for care and post-surgical recovery. "I am grateful for this opportunity to begin serving Hornell and increase access to general surgery options," Watkins said. "Providing this broad range of surgeries, including leading-edge techniques such as minimally invasive surgery, means many more patients and families can remain in this community before, during and after their procedures. That is our goal whenever possible." He received his medical degree from the Medical College of Wisconsin, and completed his general surgical residency at Wisconsin’s Gundersen Lutheran Medical Center, which is well known for training surgeons who wish to serve patients in rural locations. Watkins served as a rural surgeon in Wisconsin for three years with the Mayo Clinic, and for the past 15 years has been an attending surgeon at Rochester General Hospital. He has been teaching at RIT for more than a decade and at the University of Rochester School of Medicine and Dentistry since 2015. Volunteers at St. James Hospital contributed 179 hours to various departments throughout the hospital during the month of June. Those departments include Environmental Services, Information Desk, Gift Shop, Emergency Room, Progressive Care and Medical Records. St. James is actively searching for additional volunteers. Interested individuals are invited to call Connie Mullen at 607-324-8748 to learn more about volunteer opportunities and get started on their volunteer journey. St. James Hospital Board of Directors has selected Bryan J. O’Donovan, M.P.A., M.S., as its new president and chief executive officer. The announcement was made Friday morning during an employee event celebrating the hospital’s recent affiliation with UR Medicine. O’Donovan begins July 9 in his new role. He will take over for Interim President and CEO Leo Brideau, who has supported St. James during a CEO search that began in February. O’Donovan has spent the past 18 months as director of Ambulatory Administration and Practice Management for UR Medicine’s Strong Memorial Hospital and Medical Faculty Groups, overseeing 210 ambulatory hospital-based and faculty practice clinics spanning multiple counties, with patient visits exceeding 2 million last year. Since 2013, O’Donovan has served as director of UR Medicine’s Strong West facility in Brockport. The ambulatory medical center, which is part of Strong Memorial Hospital, is comprised of health care programs that include an outpatient surgical center, a multispecialty suite, imaging, primary care, oncology, orthopaedics, and the first off-campus emergency department in Upstate New York. In 2013, Strong West opened with three clinical programs and 30 employees. There are now 17 programs and 180 employees. He previously was administrator for UR Medicine’s Program in Heart Failure and Transplantation. A military veteran, O’Donovan began his health care career with the U.S. Department of Veterans Affairs, where he managed programs for homeless and disabled veterans. "From a diverse pool of candidates, Bryan’s health care experience and previous successes stood out," said Dr. Susan Gray, chair of the St. James Hospital Board of Directors. "We are delighted to welcome him to the St. James family and look forward to our bright future as we prepare to open a new hospital and further expand the high-quality clinical care we offer our neighbors." "Bryan O’Donovan is an experienced health-care administrator who has advanced the UR Medicine goal to provide high-quality health care as close to home as possible for families across Upstate New York," said Steven I. Goldstein, Vice President of the University of Rochester Medical Center who oversees UR Medicine regional hospitals, and also serves as President and CEO of Strong Memorial and Highland Hospitals in Rochester. "His proven track record of cultivating growth and his passion for rural health care make Bryan an ideal choice to lead St. James Hospital as part of the UR Medicine system." Contact Becky Shick (607) 346-7186 with questions. Volunteers at St. James Mercy Hospital contributed 267 hours to various departments throughout the hospital during the month of April. Those departments include Environmental Services, Information Desk, Gift Shop, Emergency Room, Progressive Care and Medical Records. St. James Hospital and Foundation announced the appointment of Linda Blauers as Executive Director of the Foundation, effective May 15. Ms. Blauers will also assume responsibilities for the communications and marketing functions for the hospital. She has served the hospital as Public Relations Specialist for the past 13 years, as well as St. James Mercy Foundation Fund Coordinator for the last few years. According to Leo Brideau, President and CEO of St. James Mercy Hospital, "Linda’s deep knowledge of the community and her tremendous skills in communication and relationship building will serve St. James well, and more importantly, will provide great support to St. James’ efforts to serve the people of the Hornell area." "There is so much optimism surrounding the building of a new hospital," said Ms. Blauers, it is an honor for me to take on this new and exciting role. St. James is such a valued part of our community, I look forward to helping build partnerships and enhancing relationships that will strengthen the Foundation and the hospital to the benefit of area residents. Final plans are in place for the 29th Annual Healthy Kids Day at the Kids 1/4 Miler. This event, co-sponsored by St. James Mercy Hospital, the Hornell Kiwanis Club, Oak Orchard Health and the Hornell YMCA, provides an opportunity for children ages 2 to 12 to participate in a fun activity while promoting physical exercise as a key to good health. The event will be held on Saturday, May 19, 2018 at Maple City Park in Hornell at 9am. The event will kick off with Healthy Kids Day. Parents and children can interact with several local organizations promoting healthy lifestyle choices. The Kids 1/4 Miler races will promptly begin at 11am. Entry fee for the race is $5.00. Call the Community Services Office at St. James Mercy Hospital (607-324-8147) for more information or to pre-register your child for the race. The Hornell Rotary Club has engaged the laboratory services of St. James Hospital for its annual Community Blood Screening. The screening will be offered from 6am to 11am on Saturday, June 2 in the Cafeteria at St. James Hospital. Please note the change in location and use the Canisteo Street entrance by the gazebo and across from the helipad. The Blood Screening Program is open to uninsured/underinsured and anyone over 18. These screenings serve as an inexpensive way for community members with high-deductible health care plans to monitor their health, or it may be an early warning system in identifying potential health problems. A comprehensive blood screening is conducted for a $35 fee with the results sent to the participant’s physician. Screening for prostate cancer is available for an additional fee. Information will also available on free screenings from Cancer Services Program of Steuben County. To register, please call 607-590-7423 beginning May 24 between the hours of 9am to Noon or 5pm to 7 pm, Monday through Friday. As part of National Hospital Week, May 6-12, St. James Mercy Hospital (SJMH) has a number of events scheduled to commemorate the hard work and dedication to providing quality care in this community. SJMH employees will be treated to a free chicken BBQ and ice cream social, which will be served to them by Hospital management. A variety of daily employee discounts will also be available in the Hospital Gift Shop. And back by popular demand, is the website scavenger hunt with the opportunity to win a Wegmans gift card. To wrap up the Hospital Week celebrations, a banquet is planned on May 17 at The Main Place to thank volunteers and honor employees with milestone years of service to the hospital. "The ongoing commitment of our employees and volunteers to this entire community is very admirable," said Leo Brideau, Interim President and CEO of St. James Hospital. "They are the glue that keeps this hospital together, and they deserve our respect and gratitude." National Hospital Week was started by the American Hospital Association to celebrate hospitals and the women and men who support the health and wellbeing of their communities through dedication and compassionate care from the heart. Governor Andrew Cuomo has proclaimed May 2, 2018 as "Health Care Auxilian Day" in New York State. St. James Mercy Hospital is joining hospitals across the state in recognizing the dedicated auxilian volunteers who annually donate countless hours of service to their health care facilities and communities. Founded in 1904, St. James Mercy’s Auxiliary volunteers thousands of hours each year toward fundraising and community service projects. Through their past fundraising efforts, Auxiliary members have purchased much-needed equipment for the Hospital’s physical therapy and emergency departments, supported renovations the Hospital Lobby and the former McAuley Manor nursing home. Nursing scholarships were also made available through the support of these dedicated Auxilians. The Auxiliary manages the gift shop at the Hospital, as well as coordinates events to benefit the hospital including book fairs, Trees of Life program, uniform sales, food festivals and holiday bazaars. To date, the Auxiliary has contributed approximately $750,000 to support St. James Mercy Hospital. According to Leo Brideau, Interim President and CEO of St. James Mercy Hospital, "The Auxiliary makes it possible for us to fulfill our mission – to provide a full range of services that support healthy communities, including quality medical care and holistic approaches to healing body, spirit and mind. These volunteers often work behind the scenes to provide comfort and support to patients, families and staff. We are so fortunate to have this dedicated and talented group, committed to serving the many needs of people who come to us for care." St. James Mercy Hospital was founded in 1890 and now provides a full range of inpatient and outpatient services, including emergency, acute medical and surgical, imaging, and laboratory. Specialty services include general surgery, physical therapy, Express Care, mammography, digital imaging, a Coumadin clinic, cardiac and pulmonary rehabilitation, and a personal emergency response system called MercyLine. The Hospital works on an ongoing basis to build collaborative relationships with a host of regional partners, in order to ensure the continued continuity of critical health care services in the Hornell community. St. James Mercy is actively searching for additional volunteers. Interested individuals are invited to call Connie Mullen at 607-324-8748 to learn more about volunteer opportunities and get started on their volunteer journey. The St. James Mercy Hospital Auxiliary is once again hosting its annual Italian Food Festival and Bake Sale, formerly known as the Food Fair, on Friday, April 13 in the Hospital Lobby. The bake sale begins at 7:30 a.m. and the hot food is served from 11:00 a.m. to 1:00 p.m. The menu includes Pasta Salad, Special Italian Sauce, Sausage with Peppers and Onions Subs, Meatball Subs, Chicken Wings, and Stuffed Shells, all very reasonably priced! Attendees will also be able to purchase tickets for the five raffle items offered at this year’s event. Raffle items include a $100 Flower Pot ($100 in Cash), a Lottery Ticket Welcome Sign ($100 face value on tickets), a Garden Wheelbarrow Planter (donated by SJMH Aquinas Gift Shop), and a Wine Basket (donated by SJMH Administration). Raffle tickets are $1 each or ten for $5. There will also be a 50/50 cash drawing and these tickets are $1 each. All drawings will take place at the conclusion of the afternoon event, and participants need not be present to win. The proceeds of this event will benefit St. James Mercy Hospital, please come join us...don’t let Friday the 13th keep you at home! 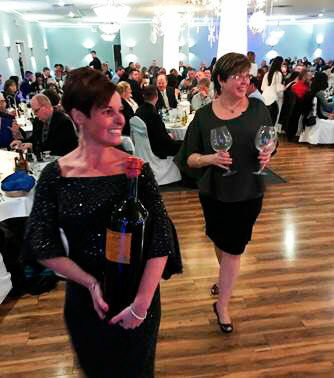 220 people packed The Main Place to raise record funds for the St. James Mercy Foundation on Saturday, February 17 at its 2nd annual "Beat the Blues" charity event. The event, which raised more than $48,000 for the Foundation, featured dinner, silent and live auctions, and dancing to the live music of The Orient Express from Victor, NY. "Beat the Blues was a tremendous success," said St. James Mercy Foundation Board Chair Lisa Schwartz. "Exciting things are happening in Hornell and at St. James Mercy Hospital, and it’s extremely gratifying to see such a high level of support for – and confidence in – the organization." Foundation Executive Director Dustin Hewit said that support was evident among individuals and business leaders who sponsored the event. "Our sponsors made Beat the Blues possible once again this year, and we are extremely grateful for their support," Hewit said. "This event, our Foundation, and indeed, the Hospital as a whole, has momentum, and that’s not something you can create for yourself." Contributions from John Carbone of The Main Place, as well as Mike Doyle of Pleasant Valley Winery, helped make the food and beverage selections top-notch. A complete listing of the businesses and individuals who donated auction items may be found by visiting the Foundation’s "Beat the Blues" web page at http://stjamesmercy.org/blues.shtml. For more information about supporting the Foundation, contact Dustin Hewit at 607-324-8233. Foundation Board Chair Lisa Schwartz and SJMH Chief Nursing Officer Neva Bossard display one of the live auction items. 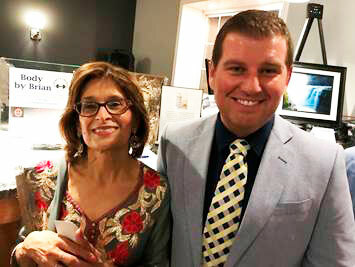 Maninder Virdee and Foundation Board Member Jesse Ells check out the Silent Auction items. St. James Mercy Hospital will welcome three new gynecological physicians to its medical staff in April. Dr. James Steven Burkhart, Dr. Tad (Gustave V) Ruckert, and Dr. Mary M. Wilsch will see patients and perform surgery at the Hospital. Gynecological services will be provided in the office located at 21 Orchard Street, Hornell, adjacent to the Hospital. The physicians will see patients there for the first time on April 10. Call 607-324-8155 to schedule an appointment or for more information. Dr. Burkhart received his medical education at McGill University in Montreal, Canada. He completed a residency in Obstetrics & Gynecology at the University of Rochester. He is certified by the American Board of Obstetrics & Gynecology, of which he is also a Fellow. A University of Rochester Clinical Instructor in Obstetrics & Gynecology, he has won the University of Rochester Medical School Ob/Gyn Resident's Teaching Award twice in his career. Dr. Ruckert received his medical education at the New York College of Osteopathic Medicine in Old Westbury, NY. He completed an internship and residency at the Albany Medical Center in Albany, NY. He is a Junior Fellow of the American College of Obstetrics & Gynecology, and the American Association of Gynecological Laparoscopists. He was awarded a Recognition of Excellence in Minimally Invasive Surgery award by the American Association of Gynecological Laparascopists, as well as an Excellence in Obstetrics award. Dr. Wilsch received her medical education at SUNY Buffalo School of Medicine and Biomedical Sciences in Buffalo, NY. She completed an internship and a residency at the University of Rochester, School of Medicine. She is certified by the American Board of Obstetrics & Gynecology, of which she is also a Fellow. A University of Rochester Clinical Instructor in Obstetrics & Gynecology, she was the winner of the William Clay, M.D. Award in Residency, the Berlex Second Year Resident Teaching Award, the Research Award in Residency 2000 (Strong Memorial Hospital), and the Ekas Award 2000 (Strong Memorial Hospital. She was also honored twice with the University of Rochester, School of Medicine’s Ob/Gyn resident’s teaching award, and the Family Medicine teaching award. Volunteers at St. James Mercy Hospital contributed 192 hours to various departments throughout the hospital during the month of February. Those departments include Environmental Services, Information Desk, Gift Shop, Emergency Room, Progressive Care and Medical Records. Leaders from UR Medicine and the St. James Mercy Hospital board announced to staff that they have finalized an affiliation agreement between the two organizations. St. James Hospital is the sixth to join UR Medicine’s network of inpatient hospitals, including Strong Memorial and Highland in Rochester, Jones Memorial in Wellsville, Noyes Memorial in Dansville, and F. F. Thompson in Canandaigua. Since 2015, St. James has partnered with UR Medicine under an administrative services agreement that has brought new health services to Hornell including primary care, gastroenterology, imaging, and otolaryngology. Last year, the hospital welcomed a Chief Medical Officer from UR Medicine, Bilal Ahmed, M.D., who leads quality improvement initiatives and helps recruit physicians to the Hornell area. The affiliation will help St. James to continue expanding services and improving patient care, and to complete construction of the new Hornell Medical Village on schedule. UR Medicine also has a collaboration agreement with Oak Orchard Health, which has helped to expand availability of primary care, pediatrics, and dental services in the Hornell area. "I’m pleased to welcome St. James Mercy Hospital into the UR Medicine affiliate network," said University of Rochester President Richard Feldman. "Through the excellent resources of our medical center, the University of Rochester is committed to supporting local health care and high-quality patient services throughout the region." "UR Medicine wants to ensure that hospitals like St. James remain the cornerstone of health care in their communities," said Mark Taubman, M.D., CEO of the University of Rochester Medical Center and UR Medicine and dean of the School of Medicine and Dentistry. "Our regional strategy supports the goal of keeping care local and allowing hospitals like St. James to serve as economic anchors for their communities. The affiliation also provides a strong connection to highly specialized UR Medicine services in Rochester, so that patients never need to leave Upstate New York for almost any medical need." The board of St. James Mercy Hospital voted unanimously in favor of their hospital’s affiliation with UR Medicine. Dr. Susan Gray, chair of the St. James Mercy Hospital Board of Directors, congratulated the St. James team and said, "Our longstanding relationship with UR Medicine has complemented the hard work of the St. James board and leadership to date, and we look forward to continuing our work to deliver top quality health care to residents of the Hornell area." Working with UR Medicine, St. James was able to secure $62.8 million from New York State for construction of a new hospital and an electronic medical record (EMR) system. Scheduled for completion in 2019, the new hospital will include 15 inpatient beds; a surgical suite with two operating rooms, two procedure rooms and 15 pre– and post–surgery beds; an Emergency Department with eight treatment rooms and four observation beds; Imaging services; and cardiac rehab. An adjacent medical office building will include outpatient specialty clinics, physical therapy, and Express Care. UR Medicine is the University of Rochester’s health care network. It includes the 846-bed Strong Memorial Hospital and its inpatient and outpatient components such as Golisano Children’s Hospital, Wilmot Cancer Center, and Flaum Eye Institute, as well as the University of Rochester Medical Faculty Group, Highland Hospital, Jones Memorial Health, Noyes Health, Thompson Health, Eastman Dental, The Highlands at Brighton, The Highlands Living Center, Visiting Nurse Service, and a range of clinical programs serving patients across western New York. Visit www.urmedicine.org. The St. James Mercy Hospital Board of Directors today announced the appointment of Leo P. Brideau as Interim President and CEO of St. James Mercy Hospital, replacing Jennifer L. Sullivan, who had served as the hospital's CEO since 2013. The hospital also announced the departure of Stan Konopko, who had served as Chief Financial Officer since 2013. "The Board is deeply grateful for Sullivan’s and Konopko’s leadership, dedication and hard work," said Board Chair Susan Gray. "In their time at the helm of the organization, they fought to preserve St. James Mercy as a viable community institution, and to pave the way for both our planned affiliation with UR Medicine and the new St. James Mercy Hospital and Hornell Medical Village. We as a board, and the entire community of Hornell, wish them well in their future endeavors." Since 2015, St. James has partnered with UR Medicine under an administrative services agreement that has brought new health services to Hornell including primary care, gastroenterology, imaging, orthopedics, otolaryngology and vascular surgery. Last year the hospital welcomed a Chief Medical Officer from UR Medicine, Dr. Bilal Ahmed, who leads quality improvement initiatives and helps recruit physicians to the Hornell area. Gray said the hospital will continue to expand services and improve patient care, and that construction of the new Hornell Medical Village will move forward without interruption. Brideau, a veteran hospital administrator who has supported St. James Mercy on behalf of UR Medicine for nearly three years, is a familiar face at St. James Mercy, because he has served as UR Medicine’s primary administrative liaison under the administrative services agreement. He has served previously as CEO and President of Ascension Health Care Network Inc., a national Catholic health system based in St. Louis; President and CEO of Columbia St. Mary’s Health System in Milwaukee; and President and CEO of Strong Memorial Hospital in Rochester. "It has been a privilege for me to work with the leadership and staff of St. James Mercy over the past two years," Brideau said. "I look forward to helping the hospital continue its path of growth and renewal as it officially joins the UR Medicine system and makes a transition to new permanent leadership." Gray said the Board will work with UR Medicine to recruit a new CEO and financial management leadership in the near future. St. James Mercy Hospital was founded in 1890 and now provides a full range of inpatient and outpatient services, including emergency, acute medical and surgical, imaging, and laboratory. Specialty services include orthopedics, general surgery, physical therapy, Express Care, mammography, digital imaging, a Coumadin clinic, cardiac and pulmonary rehabilitation, and a personal emergency response system called MercyLine. The Hospital works on an ongoing basis to build collaborative relationships with a host of regional partners, in order to ensure the continued continuity of critical health care services in the Hornell community. Working with UR Medicine, St. James was able to secure $62.8 million from New York State for construction of a new hospital and an electronic medical record (EMR) system. Scheduled for completion in 2019, the new hospital will include 15 inpatient beds; a surgical suite with two operating rooms, two procedure rooms and 15 pre- and post-surgery beds; an Emergency Department with eight treatment rooms and four observation beds; Imaging services; and cardiac rehab. An adjacent medical office building will include outpatient specialty clinics, physical therapy and Express Care. 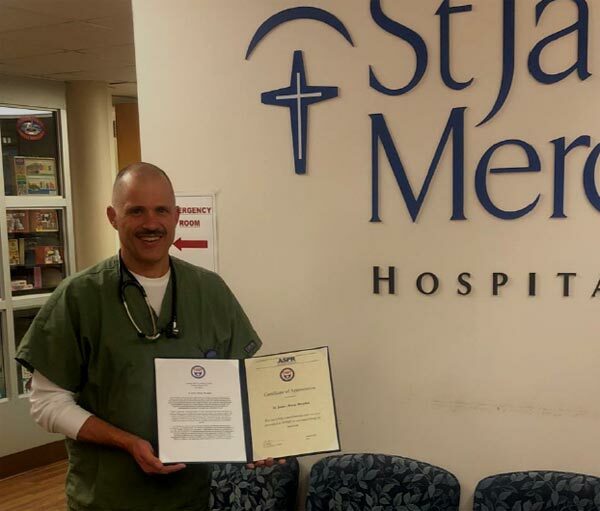 St. James Mercy Hospital (SJMH) recently received a Certificate of Appreciation from the National Disaster Medical System (NDMS), part of the U.S. Department of Health & Human Services, for participation in Hurricanes Harvey and Irma relief efforts. The NDMS thanked SJMH for affording one of its Emergency Department providers, Giacomo (Jack) Florio, the opportunity to deploy in support of Texas residents in the aftermath of the first major hurricane of 2017. A few weeks later, Jack also assisted with relief efforts for Hurricane Irma, which caused significant damage to the Virgin Islands, Puerto Rico and parts of Florida. 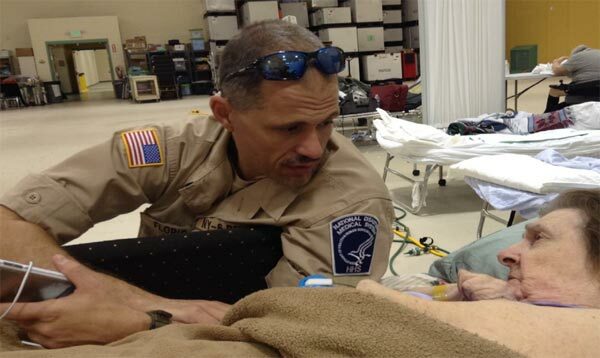 Jack Florio, PA talks with patient during Hurricane Irma relief efforts in Florida. "By allowing Mr. Florio to support Hurricanes Harvey and Irma, you have contributed to the NDMS mission. Mr. Florio’s contributions to the mission and guidance to the other NDMS colleagues were exemplary," said NDMS Acting Director Ron Miller in written correspondence. "I understand the absence of an employee, no matter the time of absence, is an additional burden that must be absorbed by the organization, and your willingness to support the absence is truly appreciated. Your commitment to support your employee’s efforts is a tribute to your leadership and the character of St. James Mercy Hospital." "While deployment can be very demanding, I love doing it!" recounted Florio. "It gives me an opportunity to help people in need of medical attention, as well as just talking with them. You find it really is a small world." Jack is often deployed for special events or any type of large gathering to provide medical treatment should the need arise. Last year, he was deployed for the presidential inauguration. On some occasions, Jack will receive a call to be on "stand-by," with only an hour or so to pack and get to the airport. SJMH is proud to have Jack Florio as one of its providers and grateful for the service he so eagerly shares. Jack Florio, PA poses with NDMS Certificate of Appreciation. 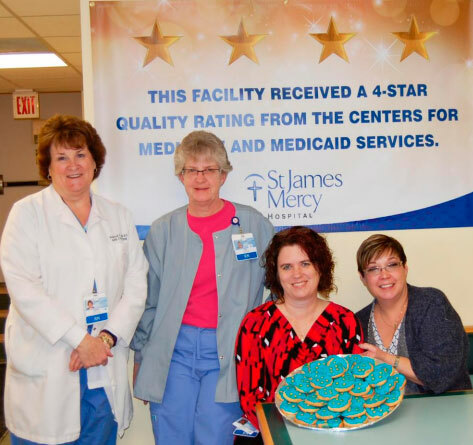 St. James Mercy Hospital has received a four-star quality rating from the Centers for Medicare and Medicaid Services (CMS). Comparative ratings on quality of care for more than 4,000 Medicare-certified hospitals across the country are posted on www.medicare.gov/hospitalcompare. One star is the lowest rating a facility can receive; five is the highest. St. James’ rating for the previous reporting period was three stars. Of 171 hospitals in New York, just 15 (9) received four-star ratings, according to CMS. Two received five-star ratings. "The most improved area of performance, which led most directly to the additional star in our rating, was patient satisfaction," said Neva Bossard, RN, MSN, St. James Chief Nursing Officer. "This is proof that our efforts are making a difference in the experience of our patients." The organization celebrated Friday by posting banners and signs around its facility informing staff and guests of the recognition. Cookies with four gold stars were also served in the cafeteria. (left to right) Deborah Spratt, MPA, BSN, RN, CNOR, Executive Director of Perioperative Services; Tracy Harvey, RN, BNS, CCRN, Clinical Nurse Lead; Cheryll East, RN, MSN, Manager – Progressive Care, Cardio/Pulmonary Rehabilitation, and Coumadin Clinic; Neva Bossard, RN, MSN, Chief Nursing Officer, pose with a plate of "Four-star" cookies, prepared by the Hospital's Nutritional Services team to celebrate the milestone. "It truly takes the efforts of every person in our facility to have a significant, sustained impact on quality and what patients experience when they receive care here," Bossard said. "We thank our physicians, staff, providers, and volunteers, because their daily work on behalf of our patients and our community is what helped us achieve this milestone recognition." According to CMS, Hospital Compare is a consumer-oriented website that provides information on how hospitals provide care to their patients. This information can help consumers make informed decisions about health care. Hospital compare allows consumers to select multiple hospitals and directly compare performance measure information related to heart attack, heart failure, pneumonia, surgery, and other conditions. CMS believes that star ratings spotlight excellence in health care quality and make it easier for consumers to use the information on the Compare websites. This is consistent with the call for transparent, easily understood and widely available public reporting. The ratings also support using quality measures as a key driver of health care system improvement. St. James Mercy Hospital was founded in 1890 and now provides a full range of inpatient and outpatient services, including emergency, acute medical and surgical, imaging (including mammography, digital imaging, Dexa scanning), and laboratory. Specialty services include orthopedics, general surgery, physical therapy, Express Care, a Coumadin clinic, cardiac and pulmonary rehabilitation, and a personal emergency response system called MercyLine. The Hospital works on an ongoing basis to build collaborative relationships with a host of regional partners, in order to ensure the continued continuity of critical health care services in the Hornell community. 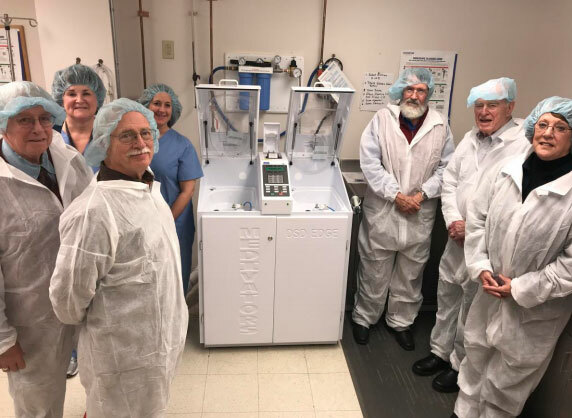 St. James Mercy Foundation has received a grant in the amount of $21,000 from the Bethesda Foundation to purchase a Medivator Automatic Endoscope Reprocessor. The equipment has been installed and is in use now in the Hospital’s surgical suite. It allows for high-efficiency reprocessing/cleaning of endoscope devices, maximizing patient safety and strengthening infection control efforts at the Hospital. "St. James Mercy Hospital is extremely grateful to the Bethesda Foundation for its continued support over the years," said Jennifer Sullivan, SJMH President & CEO. "Its generosity enables us to provide the very best in quality care to our patients. Because of this grant, and others that have aided the purchase of needed equipment across service lines, the residents of our community can be confident that they’re receiving excellent care at St. James Mercy Hospital." (left to right): Bethesda Foundation Board Member Joseph Latham, Bethesda Foundation Board Member Bill Mombert, SJMH Executive Director of Perioperative Services Deborah Spratt, SJMH President & CEO Jennifer Sullivan, Bethesda Foundation Board Member Dr. Spencer Annabel, Bethesda Foundation Board President Philip Loree, Bethesda Foundation Executive Director Janice Spence. Created in 1986, the Bethesda Foundation is a non-profit charitable organization devoted to the funding and support of health-related projects and scholarships in the Hornell area. Since its inception, the Foundation has awarded grants totaling more than $2.3 million in furtherance of its mission to support community health needs. St. James Mercy Hospital has launched a new website dedicated entirely to keeping residents of the Hornell region up to date on the construction of the new Hornell Medical Village. Located at www.thenewstjames.com, the site features photos of the construction progress, a project timeline, and an outline of what the new facilities (hospital and office building) will include. "The Hornell community has been extremely excited about, and supportive of, this project, and we designed the site to provide information quickly to anyone who wants to stay up-to-date on what’s going on," said Dustin Hewit, St. James Mercy Hospital Director of Communications. A groundbreaking ceremony was held November 8 for the Hornell Medical Village, future home of the new St. James Mercy Hospital and adjacent Medical Office Building. St. James Mercy Hospital was awarded $54.9 million from New York State in 2016 to cover construction costs associated with the new Hospital and the implementation of a new Electronic Health Record (EHR) system. In July of 2017, the State announced an additional $7.9 million for the new Hospital project. The Medical Village, located at 7301 Seneca Road, North Hornell, will provide for accessible and efficiently organized ambulatory care services. The Village concept brings together primary care, specialists, emergency medicine, general surgery, outpatient services, inpatient care, and more on one health care campus. This will make it easier for patients to access quality care, support efforts at recruiting and retaining top providers to the area, and increase delivery efficiency across the spectrum of services. The Medical Office Building is expected to open in 2018, and the new Hospital will follow in 2019. No visitors with symptoms of fever, cough, body aches, or a sore throat may enter the Hospital; they are invited to visit after being symptom-free for 24 hours. "Our primary goal at St. James Mercy Hospital is to provide the best quality of care in an environment that is safe for our patients and their loved ones," said Neva Bossard, RN, MSN, Chief Nursing Officer. "We certainly understand the desire to be with patients, and the benefits that come from visitors. Our close monitoring of influenza activity will continue, and we’ll look to return to regular visiting practices as soon as it is deemed safe to do so." St. James officials encourage all area residents to be prepared for flu season by getting an influenza vaccination through their primary care provider, pharmacy, or other venue.